CGPSC Recruitment 2019: (Chhattisgarh Public Service Commission) has issued the application on the posts of the Behavior Judge (State Level) Law and Legislative Affairs Department. 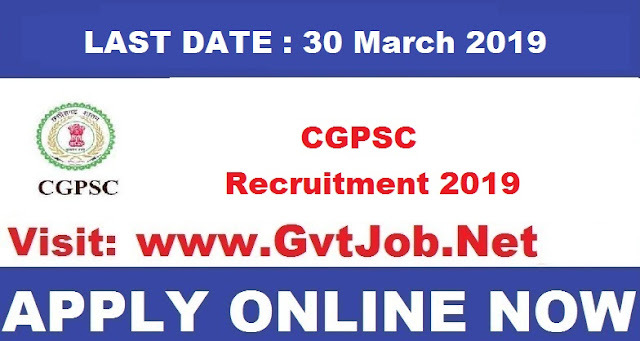 The total number of posts issued in CGPSC Recruitment 2019 is 39. Applications will be accepted online from the candidates on these posts. The last date for applying is March 30, 2019. Let us know that the candidate must have a degree in the degree of graduation degree from a recognized University. The minimum age of candidates for the posts is 21 years and maximum age is 35 years. And for the remaining candidates of all categories and applicants outside Chhattisgarh Rs 400 / - application fee will be payable. Interested candidates can apply online through the website http://psc.cg.gov.in/ from 01 March 2019 to 30 March 2019. Selection Process: Selection will be done on the basis of the main exams and the total marks obtained in the interview.